Daytona Beach, Fla. (13 March 2018)- Spirit of Daytona Racing will return to competition this weekend as the 2018 IMSA WeatherTech SportsCar Championship heads to Sebring International Raceway for the Mobil 1 Twelve Hours of Sebring presented by Advanced Auto Parts. Ready for just their second outing with the No. 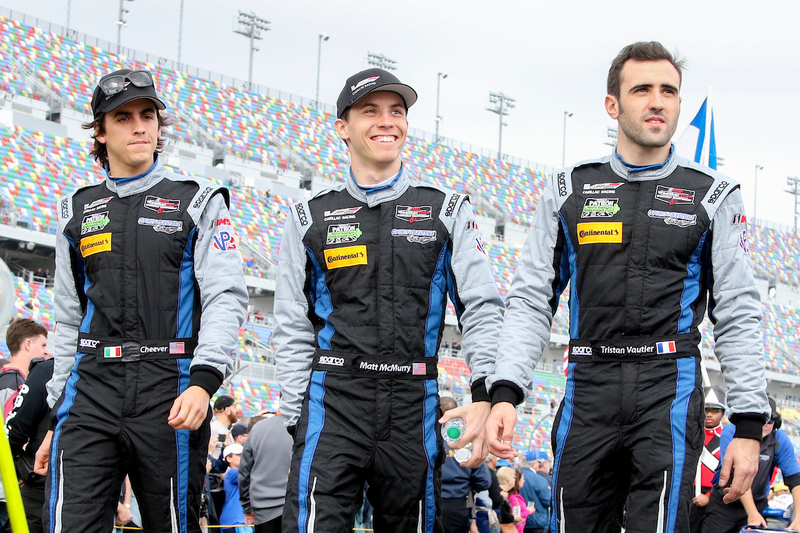 90 Spirit of Daytona Cadillac DPi-V.R, the driving trio of Eddie Cheever III, Matt McMurry, and Tristian Vautier will aim to race to the finish of the challenging day-into-night event this Saturday(FS1 10:30 AM ET broadcast). The team will look to rebound from a promising but ultimately disappointing outing in the home race in Daytona to open the IMSA season. After taking delivery of the team’s brand-new Cadillac DPi-V.R just weeks ahead of the Rolex 24, the Daytona Beach based squad delivered a performance that made it seem as though they had been working with the sleek blue Cadillac prototype for years, leading the race and posting impressive times with all three drivers. For the first time in four years, the team didn’t make it to the Rolex podium after an unfortunate mechanical setback ended the effort early. But the weekend demonstrated the strong focus that Spirit of Daytona has on returning to the top step of the podium once again after proving victorious at Laguna Seca last season. Despite being half the length of the season-opening Rolex 24 At Daytona, Sebring’s 12 Hour has developed the reputation of being twice as hard as the season opener. With a track that was first based on an airport runway, the 3.7-mile circuit is one that both thrills and anguishes drivers on every lap with a challenging combination of bumpy high-speed corners as well as slow, technical sections. Vautier lit up the charts last year at Sebring, storming to the GTD class pole and impressing with his pace, something he’s looking forward to doing once again this weekend. The race is a long-revered staple in the sport, with the track set to stage its 62nd edition this weekend. Cheever III got his first laps at Sebring during the test, and came away looking forward to making a race return in his second career Prototype race start. Team Owner Troy Flis is aware of the challenges that a track like Sebring can throw at a team, but is approaching the iconic event with the confidence that comes from seeing his team perform so well in Daytona. The race will open with practice on Thursday, March 15 with the grid set to be determined on Friday, March 16 with a St. Patricks day 10:30 AM race broadcast for the second race of the 2018 IMSA season.